Walmart is a great place to buy groceries, a loyal 15-year customer says. According to this experienced shopper, you can save up to 30 percent on basic items like cereal and canned goods. Just stay away from the produce -- you can get fresher fruits and vegetables elsewhere. Also, make sure to check the expiration dates on items. Walmart has been known to leave expired items on shelves. If you have a coupon, make sure to print out Walmart's latest coupon policy, as cashiers may not be familiar with the updated practices. And if what you want isn't in stock, Walmart does issue rain checks, says TheDealYo. However, much like in the case of coupons, it's best to have a copy of the full disclaimer in hand when you're shopping in person. In fiscal year 2012, Walmart registered approximately $444 billion in sales, which is $20 billion more than Austria's GDP. If Walmart were a country, it would be the 26th largest economy in the world. If Walmart were an army, it would have the second largest military in the world, behind China. Walmart is bigger than Home Depot, Kroger, Target, Sears, Costco, and K-Mart combined. China's exports to Walmart accounted for 11 percent of the growth of the total U.S. trade deficit with China between 2001 and 2006. If Walmart's more than 900 million square feet of retail space were spread out over one place it would take up roughly 34 square miles, which is about 1.5 times the size of Manhattan. Walmart parking lots alone take up an area roughly the size of Tampa, Florida. 90 percent of all Americans live within 15 miles of a Walmart. The Walton family has given away about 2 percent of its net worth to charity — Bill Gates is giving away 48 percent of his net worth and Warren Buffet 78 percent of his net worth. An additional Walmart Supercenter per 100,000 residents increases average BMI (body mass index) by 0.25 units and the obesity rate by 2.4 percent. Roughly 4,700 (about 90 percent) of international stores operate under a banner other than Walmart, including Walmex in Mexico, Asda in the UK, Seiyu in Japan, and Best Price in India. If you're looking for new glasses, Walmart may have what you're looking for. Walmart Vision Centers are known to offer competitive prices and quality. Not only do they provide complete eye exams, but their prices on eyeglasses and contacts are much lower than well-known optical chains. Of course, if Walmart accepts your insurance plan, you'll be able to score even bigger discounts on exams and eyewear. 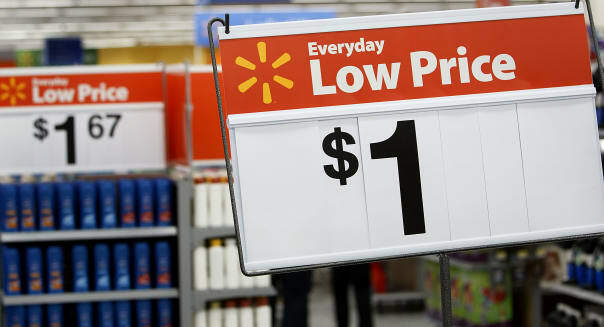 Walmart offers price matching for products that are advertised for a lower price by competitive retailers. FabulesslyFrugal recommends bringing copies of current ads to the store and handing them to your cashier before he or she rings you up. Of course, it always helps to have a printout of Walmart's Price Matching Policy on hand in case you have any issues. When it comes to higher end, brand name merchandise, head to Walmart.com. This shopper found that the company's website offered a wider selection of goods than the brick-and-mortar stores, some of which is exclusive to the site. "For example, I have never seen an Olympus PEN Micro Four Thirds Camera in a Walmart store, but they are competitively priced online," Spains says. So, pay attention, Walmart shoppers. Even with its generally low prices, there are ways to save more at this popular big box retailer -- you just have to know where to look.